Where to begin? This has not been a dull week, that's for sure. Let's just start out by saying we have all had many learning experiences this week, but not as much scheduled school work occurred as I planned. (insert maniacal laughing). We started the week out with our planned family trip to the corn maze. 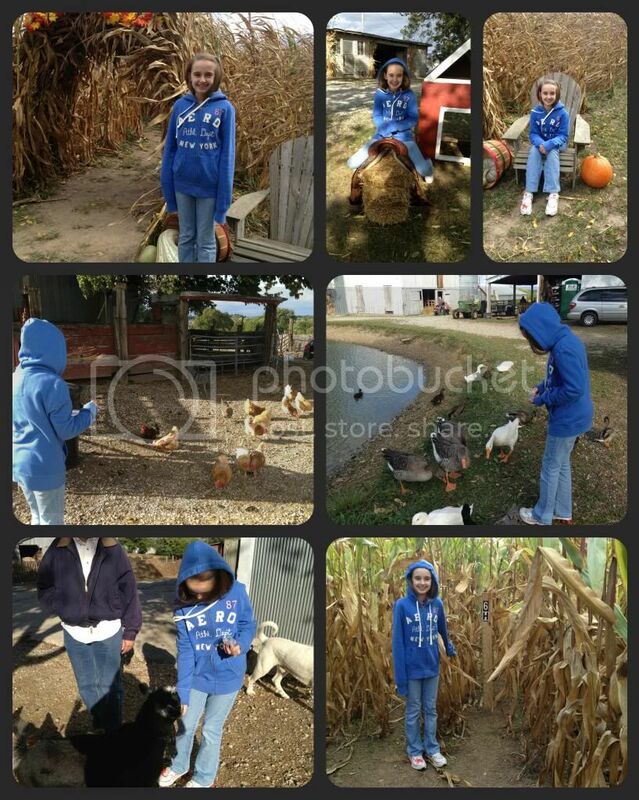 It is a fun Autumn tradition for us and conveniently there is a working farm 1/2 mile from our house. Amber's map reading skills are marginally improved from last year; her fear of chickens pecking her feet is lessened; she actually let a goat eat from her hand and declared it to be her favorite part despite being clearly allergic to goat (she had the mother of all sneezing fits when the goat was near); Amber fed ducks for the first time in her life, but was not willing to let them eat from her hand. All in all, it was another successful corn maze / farm trip. (MIDDLE-L) Feeding the chickens. This year she knew not to throw it at her own feet. (MIDDLE-R) Feeding the ducks. She welcomed them at her feet, just not to eat from her hand. (BOTTOM-L) Feeding the goat from her hand. Much better than the pygmy goats at Grant's Farm. That experience scarred little Amber for life. LOL. (BOTTOM-R) Finding a corn maze marker all on her own with only a few map reading errors. 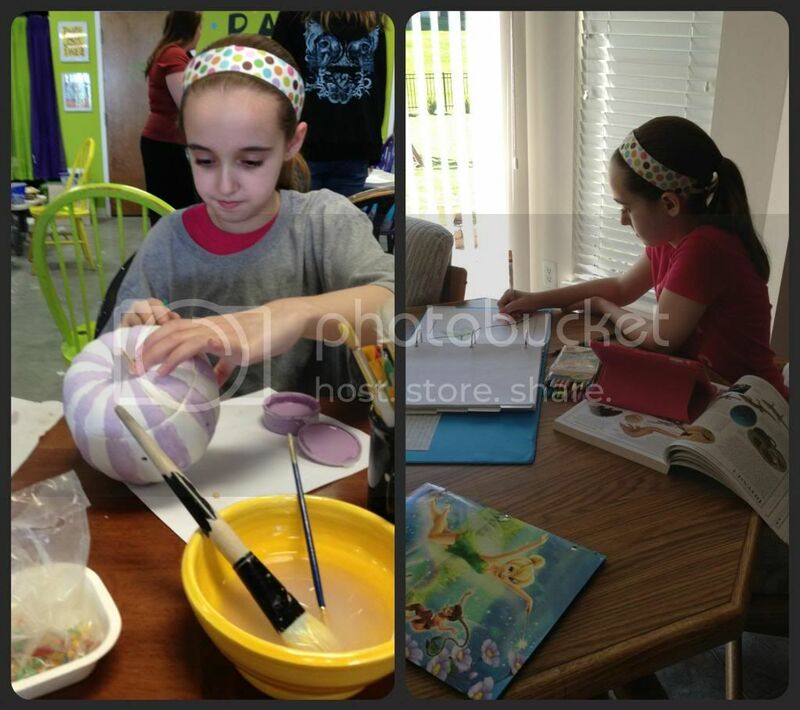 In school work, Amber managed a couple of math lessons, a full week of biology, and history. She is still on ancient Egypt, and we still didn't get to the cartouche. Maybe next week we can manage some fun history projects. There was also a full week of spelling, three days of grammar (a test is next and that wasn't happening Thursday or Friday), a full week of literature (Aesop's Fables), and a couple days of Latin. Amber managed all her music classes and practices at home which was a feat unto itself. She enjoyed art class the best of all her lessons this week, and attended all her dance classes even if she didn't fully participate in the Thursday sessions. It sounds pretty pathetic until you read farther on in this post. In all, I'm impressed that she was dedicated enough to complete this much school while having a good attitude about it all. See? Actual school work happened this week. I promise. Amber painted her custom clay pumpkin. The second paint color is an orange mixed with glass fragments. It looks very cool! The big story of the week has been Amber's health. Saturday, Amber was not acting right and kept telling me she was tired and dizzy. She ate the same foods as she always eats on Saturdays since we have our regular restaurants. Actually, we made her eat more at dinner than normal. Sunday morning we attempted to wake her for church but found Amber pale and very lethargic. She barely managed to communicate that she was dizzy, having hot flashes, and her stomach hurt. Being a diabetic, I have all the supplies and decided to check Amber's blood sugar. Thankfully I did check because it was only 50. We hurriedly got some juice inside the kid and her blood sugar rose a little. Needless to say, we didn't go to church, but eventually we stablized her blood sugar. Monday morning was the much needed visit to the GI doctor. Unfortunately, the doctor told us some things that I didn't really want to hear and scheduled a bazillion more tests. Amber completed the blood tests right off the bat on Monday because some of them will take approximately two weeks for results. The A1C results should be back any hour now, but we expect it to be fine. The GI doctor has been suspecting, in the back of her head, that Amber might have Crohn's disease, but she did not want to voice that fear until most other possible conditions were ruled out. The majority of the other plausible conditions have since been ruled out and the GI doctor is now pursing every last possible test for Crohn's to prove or disprove it as the cause of Amber's problems. There have already been some test results that support such a diagnosis, but it is not enough to be conclusive. The doctor ordered a hydrogen breath test for fructose malabsorption, a barium swallow x-ray of upper and lower GI, and the camera pill swallow test. Sound any fun to you? Me either. (TOP-L) At the GI doctor. "What are you doing? I don't want pictures from here". (TOP-R) Hospital for barium swallow. Yum. Actually, who am I kidding. Massive Yuck. (BOTTOM-L) Re-enacting her face after drinking fructose water. Eating some much needed food. (BOTTOM-R) Laughing at herself and still chowing down on those scrambled eggs. Amber completed the hydrogen breath test on Wednesday. We expected it to be easy peasy since she did a hydrogen test in June for bacterial overgrowth. The earlier test was an annoying three hours long, but otherwise it was just a quiet time for school work in the waiting room. Every half hour Amber had to walk 10 ft from the waiting room to the nurse's station to give a breath sample. Wednesday, turned out not to be quite as easy. From about 15 minutes into the test Amber started feeling awful from drinking 15 grams of fructose in water. That didn't happen last time when she drank glucose. After the second breath sample, Amber returned to the waiting room to tell me "I'm done. The nurse wants you to come back with me." Uh-oh. That's not good. It was supposed to take three hours again this time. We took tons of school work that had barely been started. Turns out Amber's hydrogen levels were quite high by the second sample and there was no need to complete the test. Amber has Fructose Malabsorption, along with the gluten intolerance. Additionally, the levels (and Amber's reaction to the drink) indicate that she can tolerate next to no fructose at all. Not even a tiny amount. No fructose, no fructans, and possibly not even sugar (cane sugar is one molecule of fructose and one molecule of dextrose). For now she is allowed small amounts of cane sugar, but absolutely no fructose. That makes feeding Amber fun. (insert desperate frenzied mother face as I see the list of forbidden foods.... a diet without fruits and most vegetables). You might ask, is that it now? A diagnosis? But no... we have more medical fun still to come. Apparently, this just makes Crohn's even more likely. We haven't even been referred to the dietician yet because they expect Amber to need another appointment in a week or two after the Crohn's testing is over. I did nearly have a small mental breakdown over that piece of info. I don't know how to feed my child, yet there is no need to learn presently because it will become even more restrictive in a couple weeks? Right.. I might have been a bit hysterical when explaining it all to Fred Wednesday evening. This is just a small sample of the items in my pantry that have to go. This seems like deja vu. Just a few months ago I dumped all the glutenous items from the pantry and freezer. Now all sources of fructose, fructans, sorbitol ( actually all the "-ols") must go. 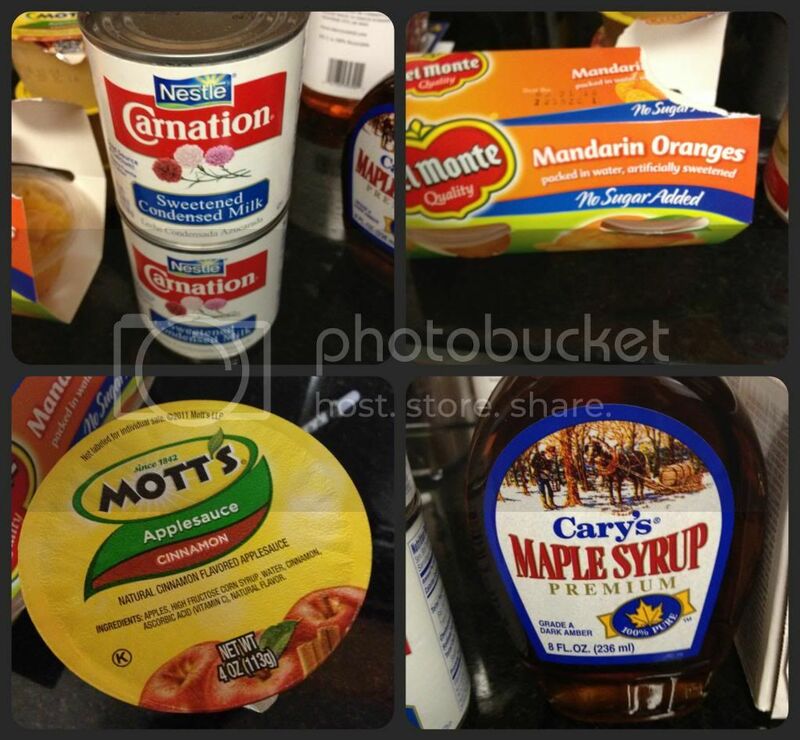 This includes honey, molasses and maple syrup too. Thursday we were back at the hospital, directly across the hall from the GI doctor's office, for the barium x-ray. That was the single most unpleasant experience in Amber's life. I'm pretty sure this is not an exaggeration. Amber actually said "I'd rather keep being sick than finish this test." If it had just been upper GI then we'd have all been in fairly decent shape and there would have been little to remark about. Unfortunately, Amber had to drink a huge amount of barium that did not seem to agree with her. After the initial images, she had to be x-rayed every half hour until the barium made it through the colon. This test was longer than the previous day's hydrogen test. Eventually, we were given the all clear and raced out of the hospital before they could call us back. Thankfully, Amber did gain back some appetite after the barium test, so we met Fred for lunch close to where he works. It's fairly hard to feed Amber these days, but we found a soup she could eat and she picked at a salad (hold the tomatoes, croutons, carrots & cucumbers... oh is that cheese lactose free?). After lunch, I tried to take Amber clothes shopping for some desperately needed Fall items. We made an attempt at that on Tuesday as well, but came away with only a few things. 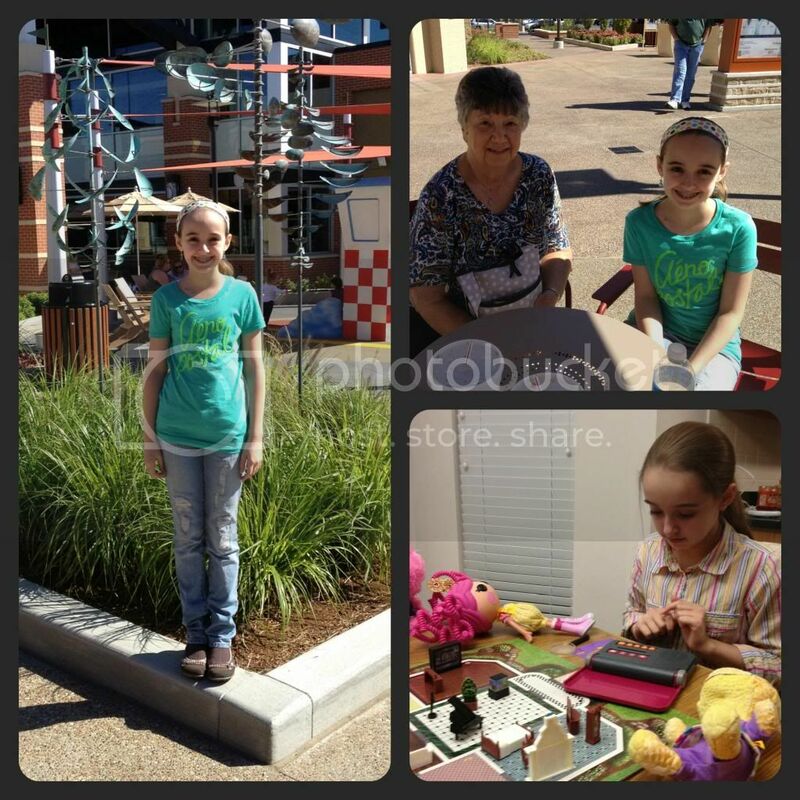 At least on Tuesday we had a fun day playing hookie from school, perusing the new outlet mall in a nearby suburb with my mom, and buying almost anything but clothes. That was a good day even if Amber was on a test prep diet. Shopping at the brand spanking new outlet mall in the middle of an affluent suburb. So much better than driving out in the middle of nowhere for one. Playing Mystery Mansion with Mom and Dad (and accompanying stuffed friends). Amber loves this old game. However, Thursday Amber really just wanted to go to the American Girl store for a little bit of happy instead of clothes shopping. How do I refuse that? The answer is, I don't. I'm so tired of Amber's sad and sick face. I'm tired of her having to be a "great trooper", as all the medical people keep telling me. So we went to the American Girl store. I made it out of the store without purchasing a new doll (she might have been promised one for Christmas), but we did end up with quite a few accessories. Friday (today!!!) we are going on a planned "field trip" to the St. Louis Zoo. We have no specific animals in mind to visit and are not participating in any programs. Amber invited a friend to go with her, so it's just us three girls hanging out with the animals, except Amber's favorite pengies. Penguin and Puffin Coast is closed while they are working on the new polar bear exhibit next to it (for which they have no polar bears), sniff. Today Amber did voice that she feels out of place now. If you have any ideas how to make Amber feel even remotely..average(? ), I'm all ears. I'm hoping this was just a product of a bad day and not a new issue. Normally, Amber handles any questions about school with grace and aplomb. No matter how they are phrased, "Why aren't you in school", "Which school is out early today", "What school do you attend", "Do you have to go back to school after your dr visit today? ", etc, Amber deals with them simply and succinctly. I rarely need to step in with an explanation. Today, we received an inordinate number of questions about school from the hospital staff, restaurant workers, and nearly every employee of the American Girl store. Seriously? Then, I had to turn down a very kind invitation for afternoon snack at the American Girl Bistro because I had no idea of the ingredients in their food. This totally embarrassed Amber, especially after I had to research all the food at lunch too. Finally, she had some trouble walking without stumbling today. I'm chalking it up to exhaustion and lack of concentration. But, she kept tripping over her left leg. Amber has femoral anteversion and her left leg is the worst. It's turned at a 45 degree angle in the hip socket. So, it's a lot of work for her to make it look straight. All of this summed up to a minor meltdown before bed. Amber just feels like no matter what she does, she is always odd. I'm so grateful that she has some good friends who see the kindness in her heart and enjoy being her friend, no matter the differences. 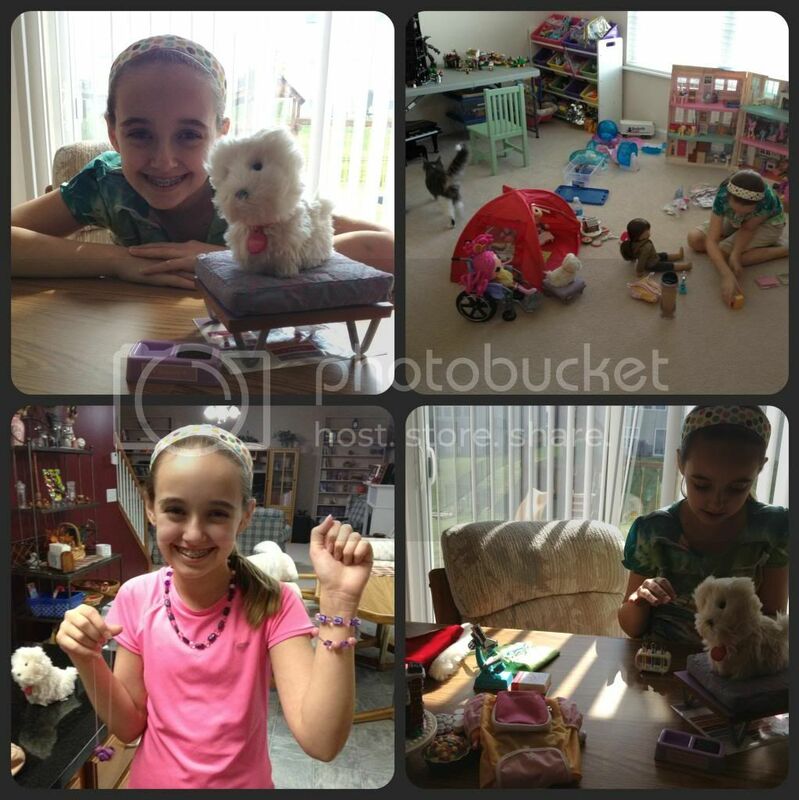 (TOP-L & BOTTOM-R) New American Girl accessories. They have a science lab kit now. How could I refuse? (TOP-R) Playing American Girl dolls before dance class. (BOTTOM-L) New necklaces and bracelets that arrived in the mail from Amber's sweet cousin. He knows she's been sick and he made those for her out of her favorite colors. He is such a sweet young man. As for my healthy life style... well, I've exercised a moderate amount (4 days.. approximately 65 minutes each day plus tons of house work because that's what I do when I'm upset). I've eaten very little because I can't fathom eating in front of Amber foods that she can no longer eat. I've made no additional doctor appointments for myself because Amber's are taking precedence. The processed food is almost entirely gone because my child can't eat most of it anymore. My hand is still wonky and it's going to have to heal on it's own because I don't have time for it right now. I've not really relaxed all week because... I can't. Amber and I did get flu shots on Tuesday so we are probably going to get the flu worse than Fred (otherwise known as He-who-will-not-get-a-flu-shot-ever-because-he-doesn't-get-sick). I have put dinner on the table at home quite a bit this week.... notice I did not say cooked. I cooked twice. I found food for us to eat out of our pantry and fridge the other nights. It's not the same as cooking. This weekend Amber's handbell choir has their first performance and other than that we are all going to sleep and pretend we are ready for the next week's round of tests. Whoa...OK...Wow! How did she ever get ANY work completed? What a whirlwind week! Gosh - I hope all these tests and changes will get her feeling better! Despite everything, she still manages some smiles. What a trooper you have!! :-) My brother-in-law has Crohn's. I'll be praying for you guys. Thank you! She is a trooper. She never causes a fuss during tests or procedures and cooperates well. I wish she didn't need to though. Oh, my, so much for your family to take in and absorb and adjust to. I hope the trip to the zoo was fabulous and just the 'medicine' you needed right now. We spent a day at the StL zoo recently and had a wonderful time! OH MAN! I do know Amber's feeling on sticking out. From ages 16-21 I had tons of medical tests and 6 surgeries all trying to figure out what was wrong with me. Tell Amber that at least her teacher is understanding. I had a teacher my Senior year act like I was going on a ski vacation when we scheduled a surgery a week before Christmas Break [which meant I got 3 weeks off from school while only missing one]. I am STILL made about that and it was over 20 years ago. It's hard to be weird, but we all are one way or another. Others just look normal because we don't know their weirdness. Praying for you guys. Thanks. Prayers are always appreciated. It's. Good reminder now we are a. Weird in some way. Oh my. Not even sure what to say to all this. I can sympathize with Amber from when I was going thru all my tests before starting chemo as a child and thinking my mom could feel your pain with what she went thru. It was a dark time but on the other side was light. Keeping the faith is my only suggestion. I will keep you both in my prayers Keep your stength momma! Thanks for the prayers. I know there is a plan here and all is going according to it. I just don't always like waiting for the reveal of the plan. Christy I am so very sorry. What a terrible, bad, no good, horrible week for you both. I am praying that the doctor will fine answers. I can not even imagine all you are going through. I can't believe you got anything done school wise! I think this age is just an awkward age whether we homeschool or public school. Keilee feels the same way at times. Like she doesn't fit in because she doesn't act like her public school friends. I just hope she feels better. She is such a talented girl who always looks so happy in pictures I know you want her back like that. Please keep me updated about what you find out. Hugs to you both. Thanks Karen. I'm a bit frazzled and at times I feel ok with it all and other times I feel like I'm on the verge of just losing the ability to deal with it all. 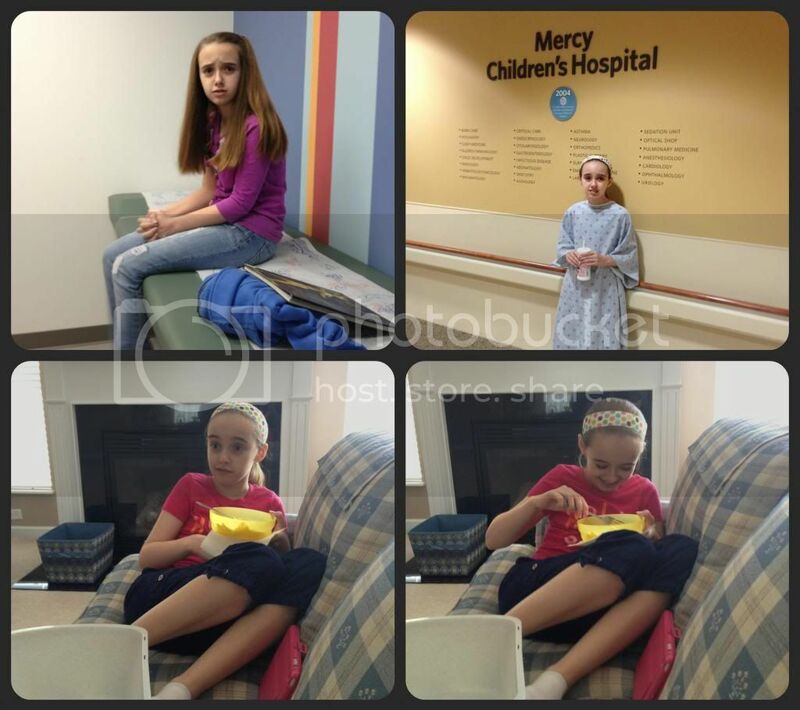 Saturday Amber had to go to the doctor for what turned out to be a bacterial infection on her foot. That was it for me. I'm so not ready for another week. Keeping all of you in our prayers. I had Philip read this post this morning and then I asked him about he deals with some of the things that make him feel out of place. He is very small for his age (50 inches tall and about 50lbs) due to treatment. When he tries to play with kids his own age they assume he is much younger than he is. He starts out by explaining that he is 11 and he adds on that he considers his size his advantage. Most kids accept that but some don't and he avoids those. I know that he has anxiety about everything but it hard to talk to him about. It comes out now and then and we talk through it. I had to do a barium x-ray when I was a teen. the memory triggered by the mention caused by gag reflex to fire up and I can still clearly remember the room. Nasty stuff to swallow. One of Philip's comment reading through was to ask me if this was why he wasn't allowed to have the veggies in his veggies soup. He had found two carrot lurking in the bottom and immediately ate them. No it was because you had just had major bowel surgery and you weren't allowed any solids until they made sure everything was working. Thanks for the prayers. Philip is a wise and strong young man for all he has been through. Anxiety is an old friend around here. I foresee a great deal more work on the anxiety again in the future. Christy, I am new to your blog...Saw you on weekly wrap-up. My heart brakes for you and Amber. What a hard thing for her (and parents) to go through. She is getting to the age where image matters a lot and I can only image how off she feels regarding that. She is so beautiful and in a few years she is gonna look back and all this will hopefully be behind her. She is going to grow up with an amazingly unique life experience which is going to lead her into helping others I bet. Tell her that we get asked the "what's your school" questions all the time...like, seriously...from every single person. I never noticed it until we homeschooled. It doesn't have anything to do with her it just has to do with ignorant people who assume that every child goes to a traditional school. We get some pretty "off" reactions when I tell them or correct them, too. Again, I am so sorry you are having to go through this. As for fitting in, we have issues at my place to but for different reasons. Does Amber have a pen pal? That might be a good start. I wonder if that children's hospital has social groups too? I will definitely be praying for you and your family. Looks like you had a busy week! The AG doll store sounds like lots of fun. We happened to catch the dolls that were 60-70% off this week :) Hope she's feeling better!! Poor Amber! I had to drink that barium stuff when my appendix was acting up! it is disgusting and made me throw up! I really do hope she doesn't have Crohn's Disease. That's a very difficult illness. Poor mom too. Very limited diet meals to prepare take a lot of research and planning. Any way...I'm with you. When our kids spend so much time suffering, we'll do anything to put a smile on their faces! I really do hope and pray that things will be much improved next week! I have been reading your blog for a while and after reading today's post I just had to make a comment. I am so sorry for everything your daughter is going through. I can Identify in just a small way because I also have a daughter with medical issues but no where near what you guys have to go through. Please let her know that she has people out here rooting for her and praying that she will be diagnosed on the road to recovery very soon. Also prayers to you for the strength, courage, and wisdom to get through it all. Thanks Diane. I hope your daughter's medical issues are resolved soon too. Today Amber is undergoing the capsule endoscopy and it is hopefully the last test for a while. Then, we just wait for all the results. We appreciate all the prayers and know everything will turn out just as He intends.